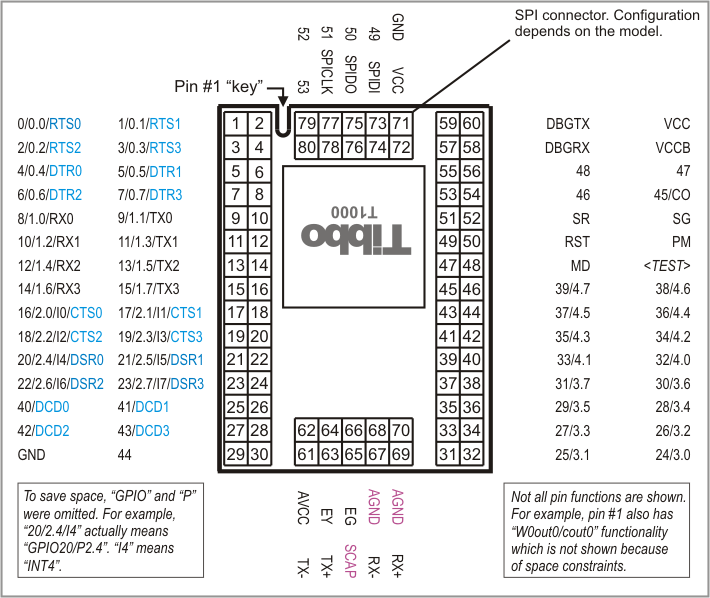 Note: "SPI connector" is now referred to as "wireless add-on port"
General-purpose I/O line 0 (P0.0). General-purpose I/O line 1 (P0.1). General-purpose I/O line 2 (P0.2). General-purpose I/O line 3 (P0.3). General-purpose I/O line 4 (P0.4). General-purpose I/O line 5 (P0.5). General-purpose I/O line 6 (P0.6). General-purpose I/O line 7 (P0.7). RX, W1, and din input of the serial port 0. TX, W1, and dout output of the serial port 0. RX, W1, and din input of the serial port 1. TX, W1, and dout output of the serial port 1. RX, W1, and din input of the serial port 2. TX, W1, and dout output of the serial port 2. RX, W1, and din input of the serial port 3. TX, W1, and dout output of the serial port 3. General-purpose I/O line 40 (does not belong to any 8-bit port). General-purpose I/O line 41 (does not belong to any 8-bit port). General-purpose I/O line 42 (does not belong to any 8-bit port). General-purpose I/O line 43 (does not belong to any 8-bit port). General-purpose I/O line 25 (P3.1). General-purpose I/O line 24 (P3.0). General-purpose I/O line 27 (P3.3). General-purpose I/O line 26 (P3.2). General-purpose I/O line 29 (P3.5). General-purpose I/O line 28 (P3.4). General-purpose I/O line 31 (P3.7). General-purpose I/O line 30 (P3.6). General-purpose I/O line 33 (P4.1). General-purpose I/O line 32 (P4.0). General-purpose I/O line 35 (P4.3). General-purpose I/O line 34 (P4.2). General-purpose I/O line 37 (P4.5). General-purpose I/O line 36 (P4.4). General-purpose I/O line 39 (P4.7). General-purpose I/O line 38 (P4.6). PLL control line (HIGH- PLL ON, LOW- PLL OFF). Red status LED control line. Green status LED control line. General-purpose I/O line 48 (does not belong to any 8-bit port). General-purpose I/O line 47 (does not belong to any 8-bit port). RX line of debug serial port (details to be published). Backup power for the real-time counter; connect to 3.3V through a 50 Ohm resistor. TX line of debug serial port (details to be published). Positive power input, 3.3V nominal, +/- 5%, max. current consumption 230mA (100BaseT, PLL on). Ethernet port, negative line of the differential output signal pair. EM1000-...- 01: 2.5V (currently in production). Ethernet port, positive line of the differential output signal pair. Yellow Ethernet status LED control line. EM1000-...- 01: external supercapacitor input. Green Ethernet status LED control line. Ethernet port, negative line of the differential input signal pair. Ethernet port, positive line of the differential input signal pair. 3.3V power available on this pin. Do not connect to the power source. To avoid current loops, only use pin #60 to power the device. General-purpose I/O line 49 (does not belong to any 8-bit port). SPI, data in [no longer in use]. General-purpose I/O line 50 (does not belong to any 8-bit port). SPI, data out [no longer in use]. General-purpose I/O line 51 (does not belong to any 8-bit port). SPI, clock line [no longer in use]. General-purpose I/O line 52 (does not belong to any 8-bit port). General-purpose I/O line 53 (does not belong to any 8-bit port). 1.This line is 5V-tolerant and can be interfaced to 5V CMOS devices directly. 2.This line can be mapped to serve as an RTS/Wout/cout line of a serial port (provided that this does not interfere with any other function). 3.This line can serve as a CTS/W0&1in/cin line of a serial port (provided that this does not interfere with any other function). 4.This pin is on the wireless add-on port (formerly known as "SPI port"). "-A" option device modification has the connector header soldered in and "available" to the host PCB. "T" option devices have a female connector. Other EM1000 versions do not have any connector installed. 5.The SPI lines are no longer used. Our current wireless add-on modules, such as the WA2000, rely on GPIO49~53 for communicating with add-on devices. SPIDI, SPIDO, and SPOCLK lines should never be connector to.